➽➽➽ 1CAPTCHAS.COM ➽➽ WORKING Recaptcha OCR + 4587 Others + TextCaptcha Solver - 20% Off For Launch!! - Page 4 — . :: GSA SEO & Marketing Forum ::. Wow! You guys the worst support ever. @Sven @s4nt0s you should rid those kinds of sellers like bhw do. It helps to maintain quality in the marketplace. @lukyjohn - Sent a PM to OP to see what is going on. We have no open support tickets, so I'm curious what your complaint is? I never responded here because I have repeatedly directed you to the manual, videos,. And literally the first thing you see when you login - "how to setup GSA with 1captcha". 1. "Add new captcha service to GSA". Just like you would captchabreaker or any other service. 3. Click "1captchas". I believe it's the first thing in the list. 4. Enter your 1captchas key (right there when you login - hard to miss. Under the bold text saying "How to use 1captchas". It's to the right of the button to open a support ticket. I know you saw it, because you have to login to open a ticket. Please READ that page. It has all the instructions you need. Text-Captchas are identical - Except you select "Add text captcha solver" in SER instead of plain old Captchas. I told you this in multiple support tickets. If this is still unclear please read them again. Beyond this I cannot help you - I literally do not know how to make it any simpler. I can give you a refund if you like, but your user-logs indicate your heavily using our service - so I assume your happy with it. Hi 1linklist, Does 1captchas support imacros? We do not have an Imacros module completed yet, however if you want to tie it in yourself you can simply modify a 2Captchas or Decaptcher module to work with our API endpoint. I'll take a look over the next few days and see how difficult it will be to cobble something together for you that can work with Imacros. I dont think it should be very difficult; if you can find open-source code for any Imacros integration supporting 2captcha or Decaptcher all you have to do is swap out the IP addresses with our own. I'll update you here when I get a chance. service is down for 24h and no support ticket answer either. I am only getting no response from 1captcha in gsa ser/cb. We resolved this a few days ago I think, but I just wanted to post here for the sake of anybody reading this thread, and let folks know that this was fixed up once we received your paypal address. Because of the way Jvzoo works we were having trouble matching your payment up with records in the back-end (Indeed, nothing showed up at all when we searched for your Name, or transaction IDs). Anyways this whole matter has been rather unfortunate, and I hope everything is settled between me and you @sickseo. As I noted in your support ticket, you've been right there with us since the beta-testing for 1Linklist (Nearly 4 years ago) and I hate to think even one of our products would leave you with a bad taste in your mouth! Our DNS is updating and 1Captchas should be back online within the hour. and not solving sometimes captchas. why ? jordan, You're doing very bad work. Your service is great when it works. The problem is that half the time it does not work. You are claiming 'Unlimited' captchas, however, that claim is irrelevant if half the time I am getting "Error Timeout" or incorrectly resolved captchas 100% of the time. I have been using your service for a few months I can tell you that the amount of time I can't use your service well exceeds the amount of time I can. In addition, you are not responding to support tickets. So needless to say, you've lost a paying customer that has signed up for the highest threads package your had to offer. I have tried to contact the seller numerous times regarding an issue with 1captchas. Ticket number: #ZTM-632774 Please address the issue asap!!! I've been dealing with a death in the family for the last 2 weeks - so sincere apologies for not paying attention to things here like I should have - but work just had to take a back seat, come what may. Anyways, I've went through all support tickets and had a few minutes to fix some ongoing server issues so everything should be back to normal. If anyone affected during this time period wants to contact me, I'll throw you a free 100 threads for 14 days to make up for any service interruptions. @errorx and @shantasia that includes you guys of course. and @errorx, please pm me here or email me at admin@1captchas.com if your issue has not been resolved already. Error time-out. No captcha solved last 2 days. No one answer me from last 2 days ago. We've just added 428 new captcha ocrs as of last night, and expanded our service to include 4 more server nodes to shorten solve times and lower demand. If you want to check us out and aren't already a subscribrr, the free trial is a great option. Tried contacting support over 7 days ago and still no response. About half the requests are getting an ERROR_TIMEOUT response. Things should be back to normal now. We're working on rolling out recaptcha2 and we're having to rebalance all the server loads while we finish up - it's more resource intensive than everything else (literally using more than all our other ocrs combined. it's beastly.) So we're optimizing it to be cost effective before we enable it for all users. We're trying to limit tweaking to low demand hours for the time being. Still getting tons of timeout errors. Service is not working now. 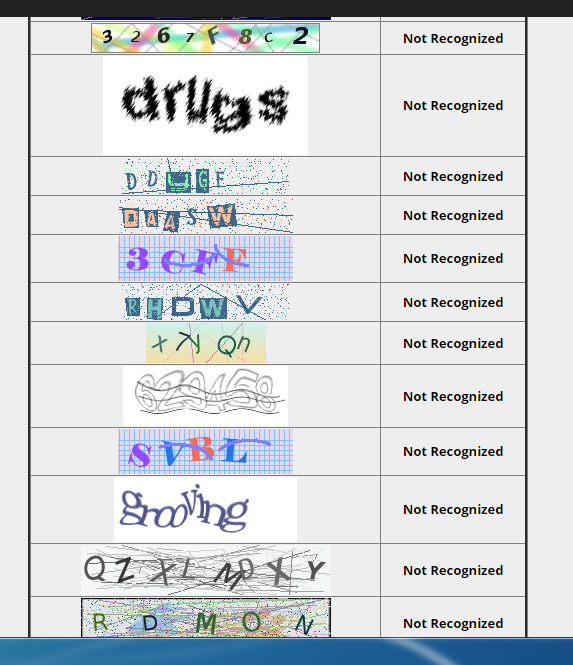 Tons of captcha is not recognized. Things should have been back to normal shortly after you made this post; I've only just now gotten around to responding here on the forum. Were very, *very* close to a scalable, cost effective RecaptchaV2 OCR and are kind of hyper-focused on it at the moment - so apologies for the slower responses lately. I'll be sure to keep you guys posted here, and via the members-area on Recaptcha2 progress. We should be ready for closed beta-access to existing subscribers within the next week. Is this now working or not?